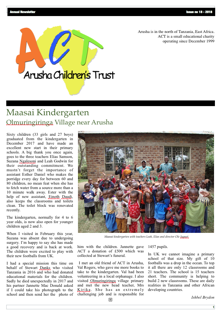 The Arusha Children’s Trust (ACT) is an NGO (non-governmental organization) which was set up in Arusha in 1999 under the auspices of Tropical Trails safari company to support underprivileged children and young adults in the Arusha and Rift Valley regions of Tanzania. Tropical Trails operates in an ethical and responsible manner respecting the indigenous people of Tanzania. Through ACT it actively assists poor rural communities by improving access to education, health and environmental awareness programmes.